The third annual Product Innovation of the Year award was hotly contested again this year. The contest examined products entered into the marketplace between September 1, 2010 and August 31, 2011. Pumps & Systems' Editorial Advisory Board and editors selected the winners. This year's winner is LUDECA, Inc. LUDECA's LEVALIGN EXPERT is a tool that allows end users to determine the flatness/levelness of bases and frames. It helps avoid strain that can occur when a machine is bolted to a distorted surface. With a level surface, problems such as vibration and misalignment can be avoided, saving money on maintenance and repair and avoiding downtime. With a second place finish in a tight race, Grundfos Pumps' SMART Digital Dosing Pump technology is intended for a wide array of water-treatment applications: drinking, process, ground, surface, recreational, recycle and reuse. It keeps processes running precisely, reliably and cost-effectively. CheckPoint Pumps and Systems' Intelliject™ Solar System took third place this year. It is a completely self-sustaining solar powered chemical injection package, so it needs no outside power source besides the sun. Congratulations to our winner, finalists and honorable mentions! 2011 Product Innovation of the Year Winner: LUDECA, Inc. 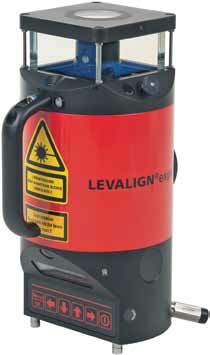 Introduced in July 2011, the LEVALIGN EXPERT allows end users to measure the flatness/levelness of the bases and frames that hold pumping equipment. Proper machine installation is critical to maximize reliability and minimize life cycle costs. One of the biggest issues in the machinery installation process is that many machines are installed under strain because they are bolted to distorted bases or frames. Checking a machine base for flatness before installation can save time and trouble dealing with vibration, misalignment and soft foot problems that are created by a distorted or non-flat surfaces. The LEVALIGN EXPERT provides an accurate and easy-to-use method for the measurement of flatness and straightness of machine bases and foundations, split machine casings, as well as flatness and parallelism of circular, rectangular and odd-shaped flanges. The system consists of a self-leveling motorized rotating laser and a sensor that interfaces wirelessly with the ROTALIGN ULTRA computer. The surface profile of the measured component is displayed with full-color, 3D graphics for a more intuitive evaluation of the results. Features, such as InfiniSplice, allow merging measurement files. This gives the operator the freedom to reposition the rotating laser to another location during measurement to overcome obstructions to line-of-sight and measure complex-shaped surfaces. Surface flatness measurement using this tool is simple and straightforward—only a single operator is needed to measure large or complex vertical and horizontal surfaces. The tool allows for flatness measurements in situations that were previously considered impossible to measure due to line-of-sight obstructions. The SMART Digital Dosing Pump technology, introduced to the market at the end of August 2010, is intended for a wide array of water-treatment applications: drinking, process, ground, surface, recreational, recycle and reuse. Appropriate processes are equally wide-ranging: chemical dosing, disinfection, pH-adjustment, cooling and boiler, cleaning-in-place, biocide injection, coagulation, precipitation/flocculation, filtration and reverse osmosis. 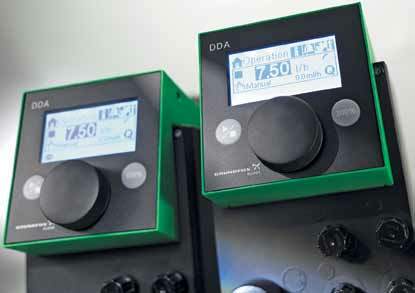 The SMART Digital dosing pumps keep these processes running precisely, reliably and cost-effectively. With the latest drive technology and state-of-the-art electronics, the user-friendly operation and intelligent flow control save chemicals with high dosing accuracy. The pumps also include an intelligent decision-making microprocessor that can compare the user-set capacity against real-time signals and adapt the injection rate. The pump has been used at the Beaufort – Jasper Water and Sewer Authority (BJWSA), which is a non-profit authority established by S.C. to provide drinking water and treat wastewater in Beaufort and Jasper counties.